NASHVILLE, Tenn. Sept. 22, 2015 – Historic Nashville, Inc. (HNI) today announced its 2015 Nashville Nine at a press conference held at the historic Marathon Village near downtown. Mike Wolfe joined HNI representatives to reveal the Nashville Nine properties and to underscore how vital preservation is in maintaining Nashville’s unique character. Wolfe, who now calls the Nashville area home, is the star of the History Channel’s hit show American Pickers, a member of Historic Nashville and a passionate preservationist. Wolfe also owns the Antique Archaeology store in Marathon Village. The 2015 Nashville Nine was nominated by members of the community and represents nine historic properties threatened by demolition, neglect, or development. 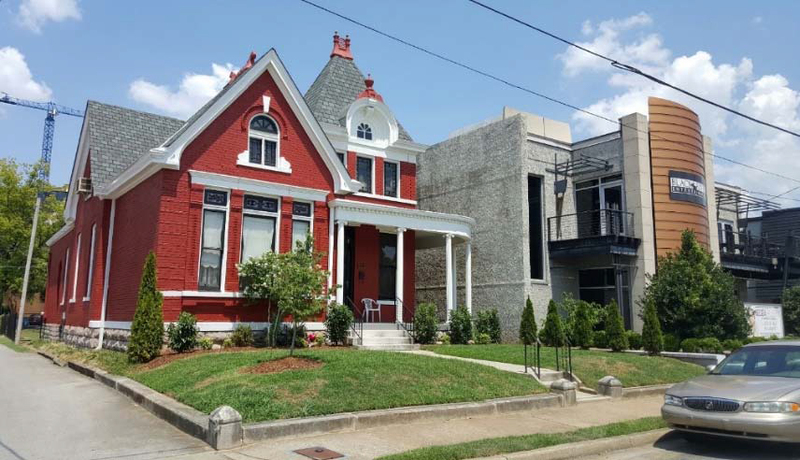 These properties will be the focus of Historic Nashville’s advocacy and outreach throughout the coming year. Historic Nashville works to promote and advocate for the recognition of historic places and the impact they have on the culture, commerce and creativity of the city. Over the years, Historic Nashville has successfully assisted in the preservation of numerous landmarks such as the Ryman Auditorium, Union Station, and the Hermitage Hotel. Several properties on the 2014 list have been, or in the process of, being saved. The city’s historic fabric, however, remains threatened. The day before the Nashville Nine was announced, the historic Trail West building on Lower Broadway, which is listed on the National Register of Historic Places, was demolished overnight. Historic Nashville documented the former home of the Trail West clothing shop in the 1990s as part of its Downtown Historic Architecture Survey. The demolition of this historic building may have a negative impact on the National Register listing of the Broadway Historic District, and strengthens the need for a strong preservation advocacy voice in the city. CLICK HERE TO VIEW THE ENTIRE PRESS RELEASE, INCLUDING THE 2015 NASHVILLE NINE PROPERTIES.